I can’t believe that it’s fall already. 2017 has been, so far, one of my most productive years as a writer, and the best is yet to come. Among the many projects I’m involved, A Vampire Thirst sees me in the double role of invited author and cover artist, and I can’t wait to share more of it with you… but all in due time. If you wish to know more about this exciting new world created by New York Times & USA Today Bestselling Author A K Michaels, pop over to the A Vampire Thirst’s Facebook page for cover reveals and snippets. My cover is up next. The High Lord of Solaria, Dragon Sol has recently returned to his planet to marry his two promised brides, but instead of savoring the pleasures of his wedding night, he finds himself fighting an enigmatic assassin sent to kill him. A skilled mercenary, Jade belongs to the Assassin Academy and lives for the thrill of the chase, but her latest mission goes awry since the moment she throws that first arrow at her intended target. Dragon proves to be Jade’s worthiest opponent yet, and what starts as any other mission becomes so much more, reversing the roles of hunter and prey. Before either of them can stop the inevitable, a deep connection takes roots until their hearts and not their lives are at stakes. The First Moon’s Dragon, first book in the second Fifth Moon’s Tales trilogy series will be published in the box set Creatures, alongside 21 more novels, and it’s available for preorder for only 99 cents. It’s cover reveal time for my Zodiac Shifters title, Bound by Water, that will be out on March 16th, 2017. This year, I’m experimenting with a few multiple authors series, and I’m quite excited for the challenge. Here, you can read the first few chapters of my merman story. 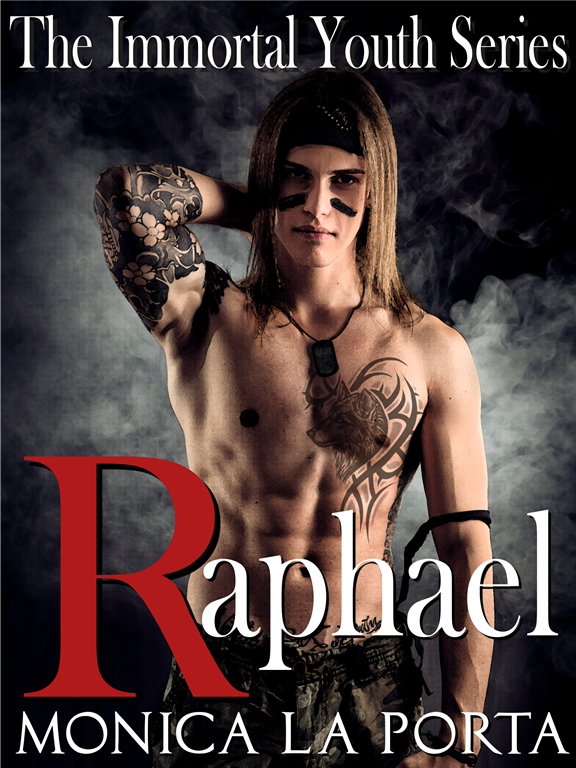 Raphael, the first book in The Immortal Youth series—a YA spin-off from The Immortals—is finally out. 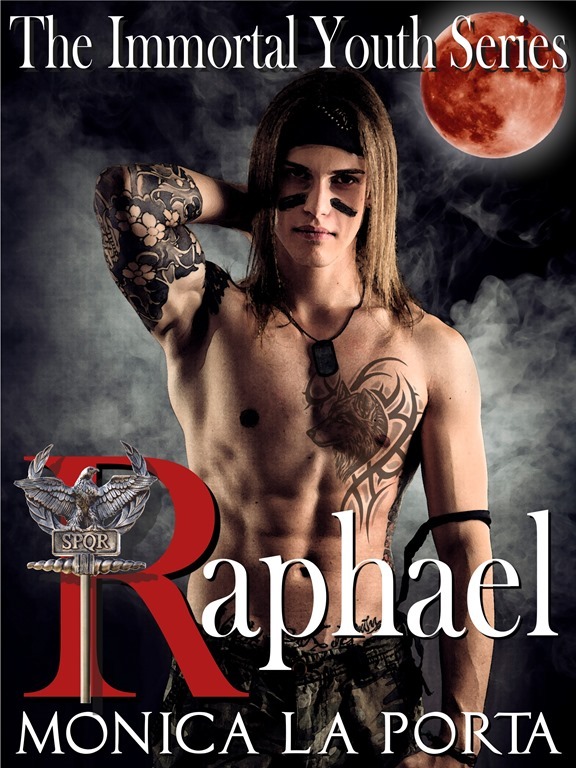 The first reviews from my ARC’s readers are so far positive, and I’m glad that people seem to connect with Raphael: a young werewolf deeply damaged in the soul and yet inherently good. Writing a story that treated a topic like abuse both physical and psychological wasn’t easy. In fact, it took me sixty days longer than I had planned, but I’m happy with how the book turned out. His heart broken and his wolf bereft, Raphael will sacrifice everything to be reunited with Luisa. Even his freedom when he discovers she’s been abducted by a street gang. But, will it be enough? I’ve been working on Raphael’s edits like there’s no tomorrow and promptly forgotten all about Friday Snippets and other promises I made. But, here I am, the next day, with a brand new snippet, and the simplified version of the cover I posted last week. The demon had his back to him, talking on a cell phone. Of all the places the man could be stalking in Rome, he had to be walking around Quartiere Coppedè. “Happy sweet sixteen to me.” Raphael was sure there was a cosmic joke somewhere to be found, but was too hard-pressed to appreciate the humor in his current predicament. Forcing himself to slow his pace, he stepped away from the fountain and reached the side of the Fairy House, now in the shadow. His heart throbbed in his throat as he cleared the corner and kept walking toward the bridged archway delimiting the neighborhood. A red bus slowed down and stopped at the curb on Tagliamento Street. With a leisure jog, he passed the arch and reached the bus stop, then hopped on the running board as soon as the bus exit doors opened. Then a sweet scent he had never forgotten hit his nostrils and he turned, his heart beating as fast as his wolf’ as he faced a familiar pair of green eyes. A feeling of belonging descended upon him like a warm blanket. “Hi,” the girl of his dreams said. Two years had passed since the night of the botched robbery, but he thought of her every day. “You’re my mate and I’m in love with you,” he hurried to say, in case she would disappear again. It had been love at first scent for him, and he had known the truth since then that he would never love anyone else in his life. His wolf pranced around to be acknowledged. “You’re so beautiful,” he whispered. His wolf demanded he nuzzled her throat, and Raphael’s breath hitched at the image. At the same time, the girl’s eyes lit and widened, casting a spell on Raphael who couldn’t see anything else but her. I can’t remember when I posted a Friday snippet last, but it’s about time to start doing it again. Yesterday, I finished writing Raphael, the first title in The Immortal Youth series (which I’ve been posting chapter by chapter on WriteOn), and I feel in a celebratory mood because it was quite the gestation. I also finished working on the cover and I want to show it off along the snippet. Raphael zigzagged in and out of the back alley he entered to lose the enforcer. The sucker had been on Raphael’s tail for a while, and so far, he had managed to escape the long hand of the law. Running at full speed, he glanced right and left looking for a secluded spot he could hide and take a breather. A soft glow illuminated the ancient cobblestones paving the street, and dew covered the ground, which made his frantic jog a loud affair where stealth was required. His trainer soles squeaked and squealed every time he changed direction. The annoying noise reminded him of that one time he played basketball with some mortal kids. Lanky as only tall genes and neglect can assure, and turned fourteen a few weeks earlier, Raphael proved to be a natural. At the recent memory, a smile tugged at his lips, but booted steps echoed from the right and he dove left under a marble arch. As an architecture enthusiast, he liked the Ghetto neighborhood, but it wasn’t built for midnight cops and robbers games. Too many dead ends, like the brick wall covered in ivy he found himself facing after his last turn. His wolf growled in displeasure.